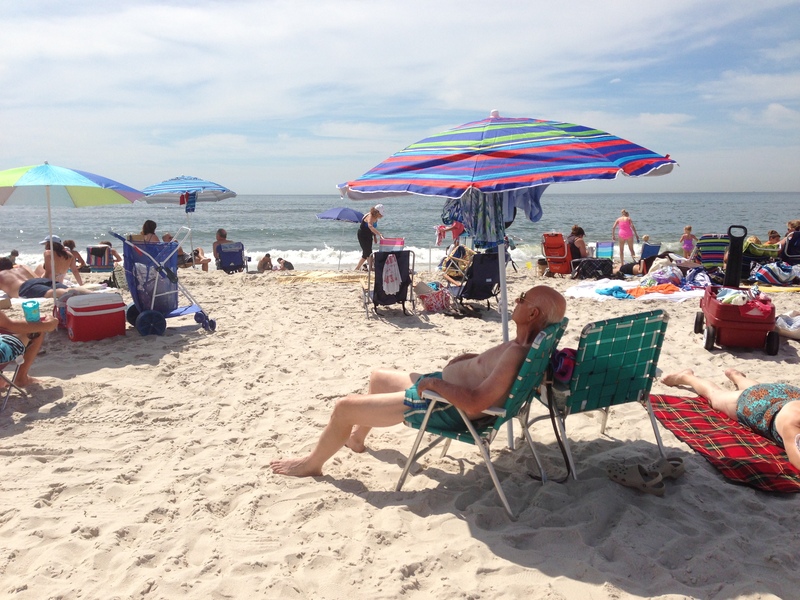 Visiting Jones Beach today was like being on a public strand circa the 1950s, the bright beach bags, chairs, umbrellas, suits (except the suits were skimpier, even on the less than skimpy subathers). Families with their chairs drawn around in big circles. Teenagers jumping around, full of beans. Grandpas dozed. Mothers and daughters plunked themselves down just like me and Maud, who immediately tugged her towel into the perfect rectangle, the perfect protected zone for her to sun her bod. The middleaged couple next to us seemed to be mooning over each other for the first hour we were there, then disappeared into a dome tent whose sides wobbled along to their muted boom box: I’ve Had the Time of My Life, sung by Bill Medley and Jennifer Warnes, the finale song from Dirty Dancing. 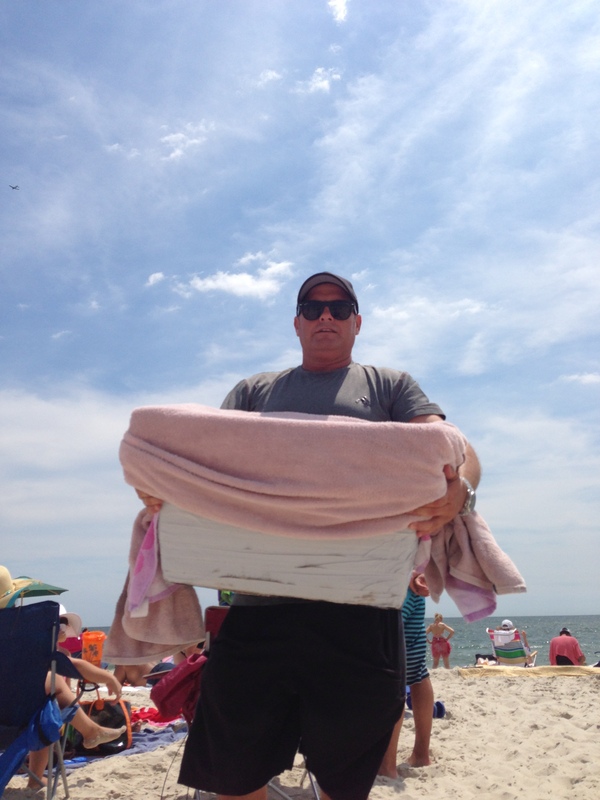 The hardest working man on Jones Beach came around in his Ray Bans and sweaty tee shirt, hoisting his cooler. Ice cream, Chipwich, frozen fruit bar! he called out. “Is this a picture for the winter?” he asked me as I captured his likeness for my personal magazine. The strawberry FrozFruit was like a rock, like a sweet Antarctica iceberg, until it melted all at once in sticky swirls around my mother-daughter friendship rings. The whoosh of the waves rolling in and out. Hypnotic. The sun that penetrated even under my floppy hat brim. Snooooooze. Flip through a magazine. Is anything really worth reading? Music. Manna for a twenty-one year old. I am beginning to wonder what effect Taylor Swift has had on her generation, a group of closet romantics. The cool soft grit of the sand as I paddle through it with my contented toes. The waves? Too cold, except for an ankle bath. 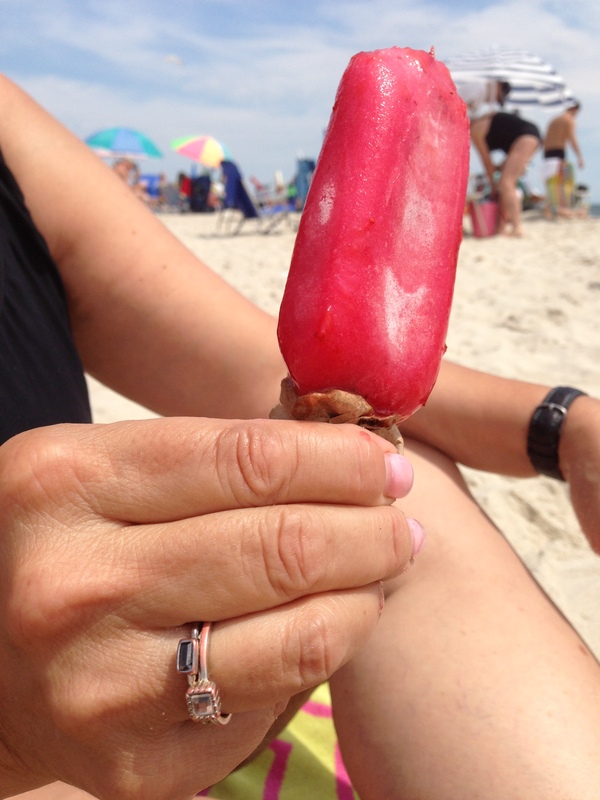 I like my fruit bar chilly, not my Atlantic Ocean. As long as the air is pure. As long as I come home with salt caked in my hair and sand dusting my ankles. 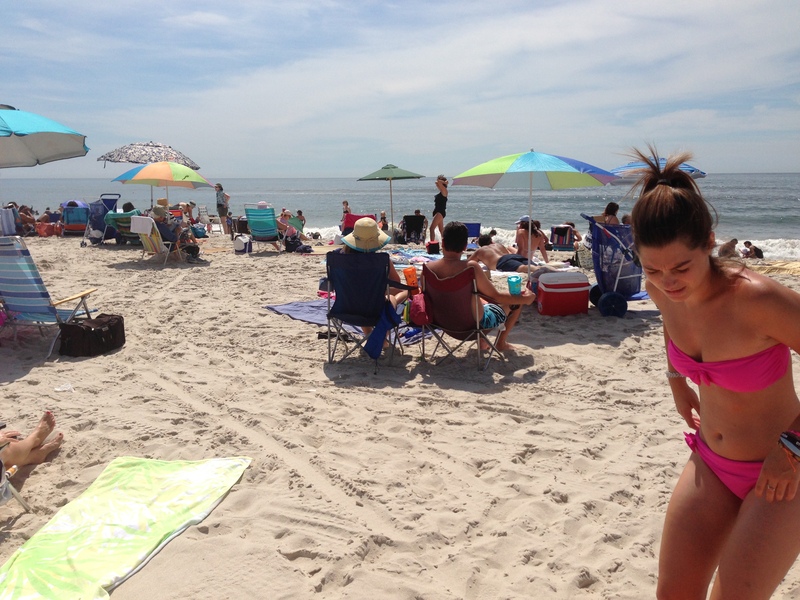 Do you know what I like about Jones Beach? You lean back and close your eyes and listen to people laugh. No more sun-tanning for me. My days of perfect bronzing are long gone. But my memories of two summers at Ocean City, NJ, are still fresh: every day on the beach, every evening at the restaurant … 1960 and 1961. Those were the days. Your beach sand looks almost exactly like Pacific coast beach sand, except ours is darker. There is soot in ours from forest fires and what-have-you, and it always leaves a dark streak on your feet. Nonetheless, it’s the same sun that warms us, the same breezes that cool us.